By Sa'ed Adel AtshanEver since my childhood, I have always felt a deep connection with Native Americans. At the Ramallah Friends School, a Quaker institution established in Palestine over a century ago, we learned about our shared history as indigenous peoples who have faced ethnic cleansing by European colonists and the importance of nonviolent resistance for freedom and dignity. I understand what means to be indigenous to a land and to feel the spirit of our ancestors calling on us to return in the face of ethnic cleansing and colonization…My relatives and friends, who are now refugees in the West Bank… would all love to hear you speak, to meet you, to break bread with you on your kitchen table in Tel Aviv. Our village and ancestral lands are actually there beside you in Tel Aviv, yet we are refugees, and Palestinians are denied our right to return to homes and lands. My family and loved ones, who would be eager to accept your invitation cannot even travel freely within our own country, finding ourselves like animals behind cages, within Israeli prison cells, with a Wall three times the height of the Berlin Wall, hundreds of checkpoints between Palestinian towns, and Israeli settlements with Jewish-only roads devastating the earth. 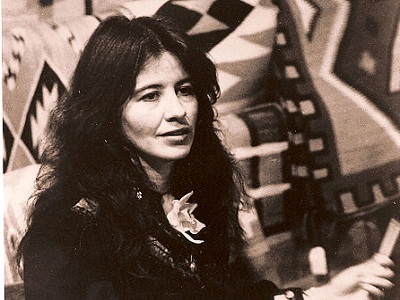 By Richard LightbownI didn’t know about Joy Harjo until she had crossed the picket line. I didn’t think anyone associated with the struggle for universal human rights would be able to ignore a military assault on an urban area where 1.6 million people are trapped and unable to flee to safety when advanced technology weapons are targeted at them. “I didn’t know.” History has heard that excuse before. From the Germans who didn’t know what the Nazis were doing. Or the English that didn’t know that four million Irish were dying of starvation even as food was still being exported from the Emerald Isle. But it sounds particularly lame in the 21st century world of instant communication when the last Israeli full scale assault on Gaza was only a couple of weeks ago. I didn’t know or I didn’t want to know? How much longer can you not know? As you step on stage and hand your victory to the criminal oppressor and give succor to the people who said that Israel should flatten Gaza on top of its inhabitants, will you still not know? But you can’t have it all ways you know. You can’t have your soul and the thirty pieces of silver. You can’t be all things to all people and be “in support of justice and compassion.” No you can’t; because supporting justice and compassion means opposing oppression and injustice. And you have just shown that you won’t oppose it. You’ve took the pieces of silver. You’ve just sold your soul and flaunted your lack of integrity to the whole world. 1) It sounds like Tel Aviv University is an especially bad place to give a boycott-busting performance. If Harjo felt she had to honor her commitment, she could've insisted on a different location. Perhaps one where Palestinians as well as could freely attend. 2) If she's a Writer-in-Residence, she's probably living in Tel Aviv for a school term--three months, or something like that. A couple of performances is one thing, but a lengthy stay puts that much more of a burden on her. She should've researched what a lengthy stay would mean in terms of the worldwide protest against Israel's actions in Gaza. And either a) canceled or cut short the trip, or b) set the terms of her stay. For instance, she'd hold Israel-Palestinian discussions three times a week during her stay. If she's merely going to perform and write and talk about herself, her feelings, or vague hopes about peace and love, that's not much help. Moreover, as her critics have said, it helps to legitimize Israel's actions. The only way her presence doesn't legitimize Israel's actions is if she actively challenges them. By holding debates, questioning the Israel orthodoxy, and making sure Palestinian concerns are heard. For more on the subject, see Harjo Performs Despite Palestinian Criticism and Harjo Faces Boycott of Israel. American Indian poet Joy Harjo didn’t realize that her visit to Israel last week would be politicized. She sees similarities between the Palestinian story and her own people’s story, including some settlers’ belief that God gave them this land, that it is their right to live there, and the native people are primitive and don’t know how to use it. “The language of conquest is very similar,” she says. The use of gun power, she says, also resembles the American story. But Harjo, who doesn’t like to be backed into a corner, kept her obligation to Tel Aviv, and requested to add in the last couple days of her trip a visit with Palestinian students and artists living in east Jerusalem and the West Bank.